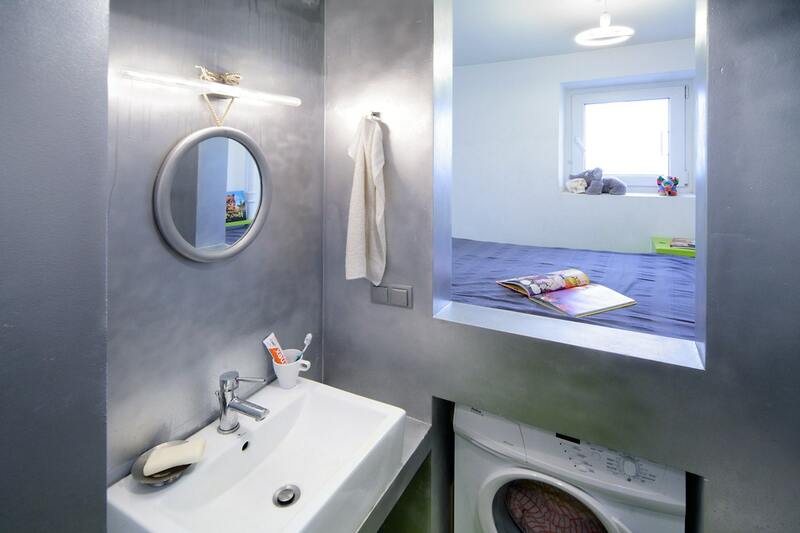 Project description: Even thought this minuscule pied-a-terre might seem unlivable, it’s prime location (just 300m from new bridge over Vistula and overlooking the Royal Castle) and spatial disposition made this 21,5m2 apartment an ideal spot for a divorced man in his mid-thirties. He uses it 3-4 times a week as a place to meet his son and occasionally to spend weekends. 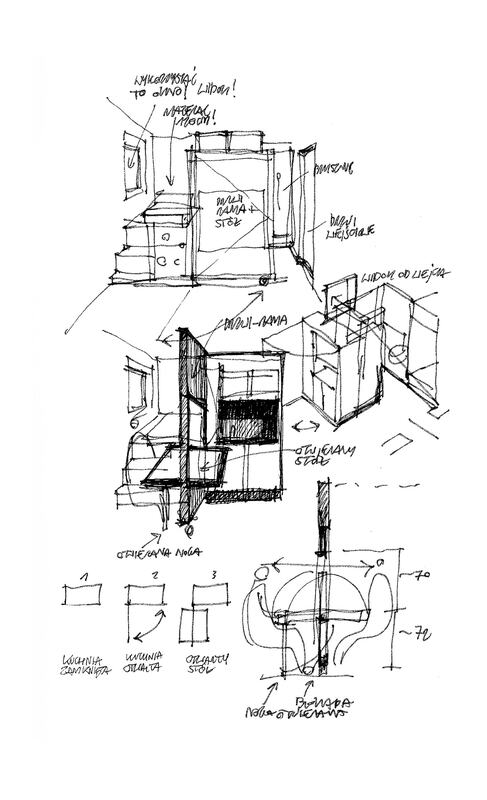 The design’s goal was to take a profit of two windows ( regarded as a luxury in such a small unit) by the smaller one as a pretext for creating a semi-separated, east-oriented alcove in place of the previous bathroom. 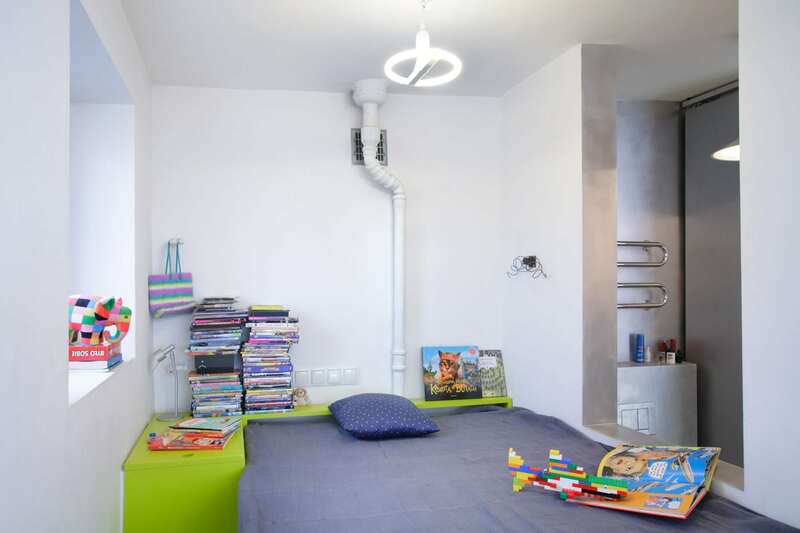 The alcove is elevated above apartment’s surface of some 110cm to provide space underneath for a washing machine extra storage room. Being placed in front of the entrance door, the small window makes a visual axis leading from entrance space, through a bathroom to the alcove. The bathroom was supposed to be separated from the alcove by use of a fixed translucent barrier, but since the empty opening is used by owner’s son as a way to run around the bath/kitchen unit, it will be filled with an openable window. The scarcity of space forced the decision of placing the shower directly in the hallway. 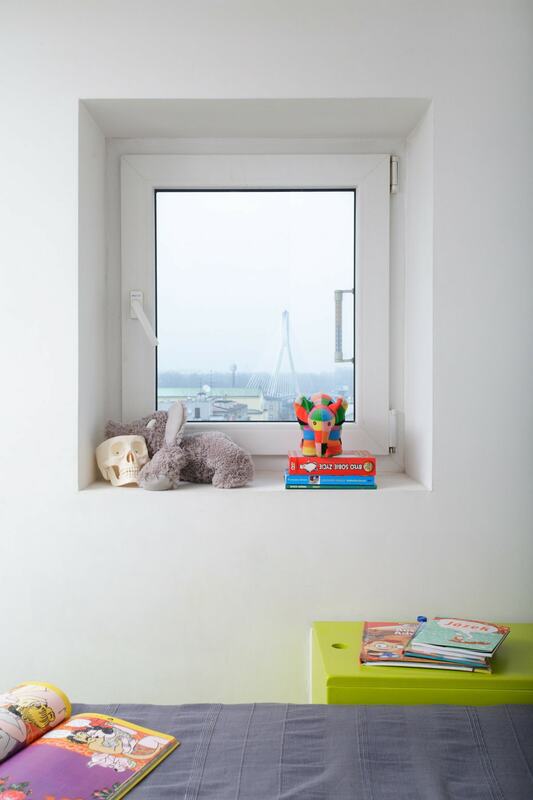 Project facts: The bigger window giving to Warsaw’s Old Town is bound-up with the living space of some 14m2. Due to space limitations there is no fixed eating space, instead, the kitchenette is equipped with a door that partially swivels to become a table for four people. 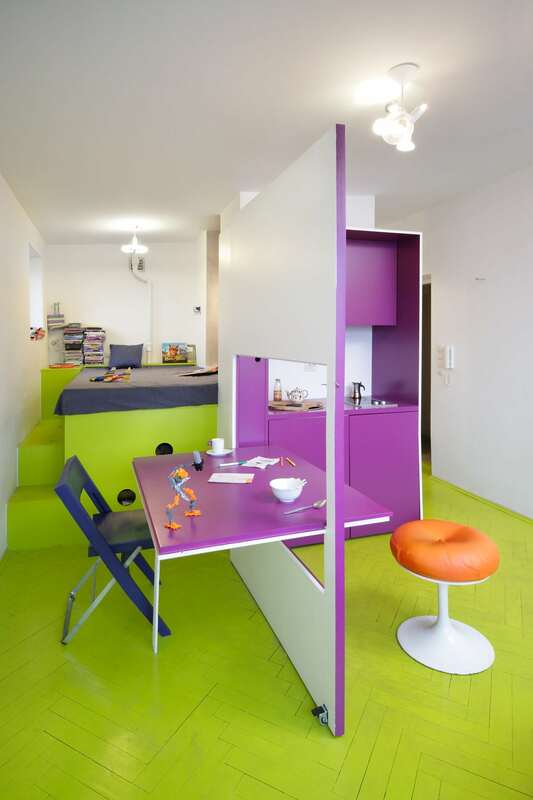 In other occasions, with the table closed, the door serves as visual partition covering the alcove.Given the limited budget (around 6000 Euro with equipment included) and required short realization period the materials used are very simple, such as oil-painted plywood, gypsum-board panels and oil-based paint in the shower. The same vivid green paint was used on the alcove platform, as on the entire apartment’s floor (Flugger’s oil paint for floors).